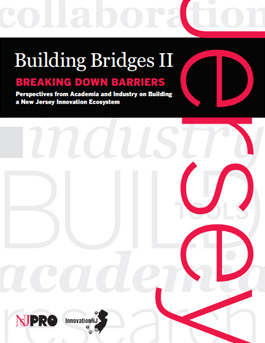 In March 2013 NJPRO and the InnovationNJ coalition released Building Bridges II, which builds upon prior NJPRO research Building Bridges I released in 2010. The original study articulates the critical need for collaboration between academia and industry in our State. The second study recognizes the importance of business, academia and government working together to advance our State’s innovation ecosystem and provides recommendations to grow the ecosystem. Building Bridges II: Breaking Down Barriers: Perspectives from Academia and Industry on Building a New Jersey Innovation Ecosystem highlights 5 challenges that currently inhibit greater collaboration between industry and higher education and 15 recommendations to address these hurdles. NJPRO completed its report on the industry-specific focus groups of industry and academic participants. Through a series of discussions, the report was developed to offer substantial solutions to foster an environment for greater collaboration between industry and academia in New Jersey. Building Bridges II is intended to serve as a catalyst to get the State, industry and academia to work together to meld their respective R&D assets to build out the state’s innovation ecosystem, grow the economy and create jobs, and reassert New Jersey’s position as a leader in innovation.